24 Jan 2013 - Demerara defeated GT&T Berbice by 4 wickets to win the Guyana Cricket Board Senior 4-day Inter County tournament yesterday at the Everest Cricket Club ground, while the game between Essequibo and the President’s XI ended as a drawn encounter with the latter taking first innings points. 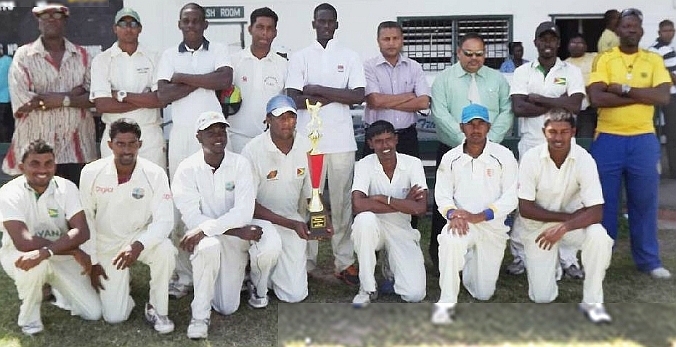 The victorious Demerara team, after defeating Berbice at Everest on 23 January to win the 2013 Inter-county senior 4-day competition. GT&T Berbice were bowled out in the first session on the final day for 200 in 80.4 overs after they resumed on 185-9 with Gudakesh Motie Kanhai on 8 and Keon Joseph on 6. Leg spinner Amir Khan accounted for Joseph (16) leaving Kanhai unbeaten on 13. Mohamed 5-40, Khan 3-68 and Shaquille Williams 1-35 were the pick of the bowlers. Needing 79 to win in just over two sessions Demerara encountered a few nervous moments before they eventually reached home in 38 overs ending on 79-6. Medium pacer Clinton Pestano reduced Demerara to 15-2 when he bowled Rajendra Chandrika (0) and Robin Bacchus (10) before Shemroy Barrington was run out for 8 at 26. Left-arm spinner Kanhai's good run in the tournament with the ball continued when he dismissed Vishal Singh for 8, and the patient Chanderpaul Hemraj, who was caught at extra cover for 38 as Demerara found themselves in a spot of bother at 68-5. Hemraj's innings lasted 76 minutes and came off 79 balls and included two fours and one six. Kanhai who bowled with good loop and lob then removed Zaheer Mohamed for 5 with the home team 4 runs away from victory but Shaquille Williams sealed the issue for Demerara when he swept Kanhai to the long leg boundary to remain not out on 9, while Joseph Perry was left not out on zero. Kanhai grabbed 3-21 and Pestano 2-16. Demerara received a trophy and $200,000. Speaking at a simple ceremony which followed, Secretary of the GCB Anand Sanasie congratulated the victorious Demerara team, while Assistant Secretary of the GCB Dru Bahadur said the board did well to organize the cricket despite the off-field controversies. He thanked all the participating teams. Sanasie also stated that international cricket will return to Guyana during the Pakistan tour of the Caribbean in June. He said Guyana will host a warm-up game, which will be played at Bourda, and the first Test match. Sanasie said the last two rounds of the West Indies Cricket Board 50-overs and 4-day tournaments will be played locally, and they are negotiating with the Ministry of Sport, the Ministry of Tourism and the license holder of the Caribbean Premier League, Verus International, for Guyana to be one of the hosts in the CPL, which is expected to start in July. Captain of the GT&T Berbice team Assad Fudadin said Demerara performed excellently to win both the 50-overs and 4-day competitions and urged his team mates to work harder, while the winning team skipper Rajendra Chandrika thanked the GCB for organising the tournaments. Manager of the winning team Robert “Pacer” Adonis told Kaieteur Sport in an invited comment that his team played as a unit. He also gave credit to Zaheer Mohamed, Chandrika and Totaram Bishun who had to depart for Trinidad and Tobago for personal reasons before the final round. Meanwhile, overnight rain prevented any play on the final day at Wales between Essequibo and the President’s XI. Scores: President’s XI 157 and 7-0; E’bo 100.